How on earth had our gas usage skyrocketed that much? Before panic ensued, I checked our average daily consumption in units. This information is always included on your bill. 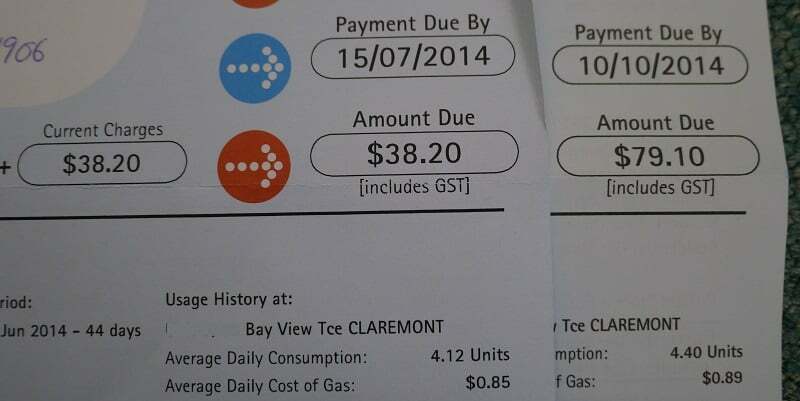 It turns out that we hadn’t used many more units than the previous bill after all. Phew! 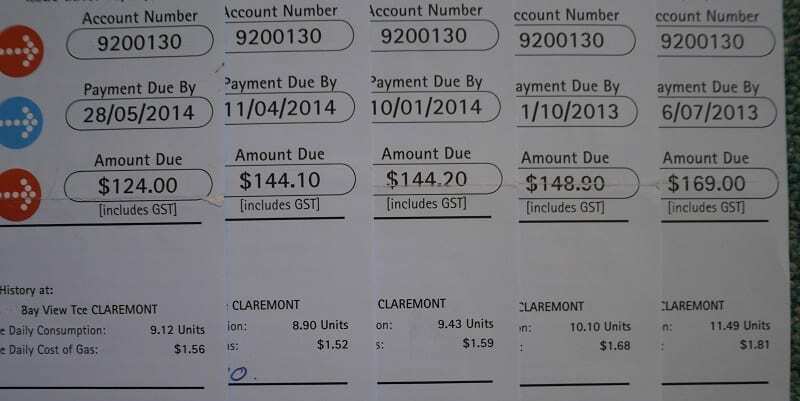 For this billing period we used 4.40 units per day, compared to 4.12 units per day on the previous bill. The new bill confirms that we’re using less than half the energy we used at the previous flat. That sounds pretty impressive. This works out to be a saving of $300, which, I think you’ll agree, is even more impressive. So what is the secret? Secondly, check if the bill is based on a meter reading or an estimate. If the bill is estimated, the amount may be very different to what you’ve actually used. You can usually contact your energy company to give an accurate reading and receive a new bill. Be wary of graphs! The energy companies can use data to manipulate what you see. The reason my graph had such a huge change was because I moved mid-way through a billing cycle. The first bill I received was for 44 days. The second was for 89 days. It stands to reason that my second bill will cost twice as much as the first bill – it’s for double the amount of days! Look for the average daily consumption, measured in units. That tells you how many units you are using every day. Energy is priced per unit, so the cost to you is the amount your company charges per unit multiplied by the number of units you have used. If you can’t find your average daily consumption, it’s easy to calculate by finding the total number of energy units used and dividing by the number of days in the billing period. For my latest bill I used 391 units over 89 days, which is 4.39 units per day. This isn’t the part where I tell you I switched providers, and offer you a nifty little affiliate link like you’ve no doubt seen a gazillion times before. Nope. Sadly the gas company in Perth has a monopoly on the supply, so I’m stuck with these guys for now. I saved that much money without switching providers. I’ll tell you how I did it. Not to a smaller house. I moved to a bigger house. I moved to a bigger house with an additional demand for gas over the previous house (this place has a gas oven; the previous place had an electric one). I might also add that the flat I moved to is in the same complex, made from the same materials and with the same insulation (or lack of). Despite all of things thing, my gas bills have halved. See? The daily energy use at my old flat was between 8.9 and 11.49 per day compared to less than 5 in the new flat. Do you know what made all that difference? This 5 1/2 star energy rating boiler that doesn’t have a pilot light meant my gas bills halved…without me doing a thing! I did everything in our old flat to reduce our gas use (that’s why the unit consumption dropped a little during the year), but there was one thing I couldn’t get away from. The pilot light. That boiler burns gas even when it’s just sitting there. Even when it’s 40ºC day and you really don’t want any kind of heat at all. Our new boiler, by comparison, only burns gas when it’s ignited. That’s all it’s taken to cut our bill by $300. We didn’t install the boiler ourselves, it came with the rental, and in that regard we’ve been lucky. However, it has also highlighted to me the importance of fuel-efficient appliances, not just for the emissions they produce but also the cost savings they provide. 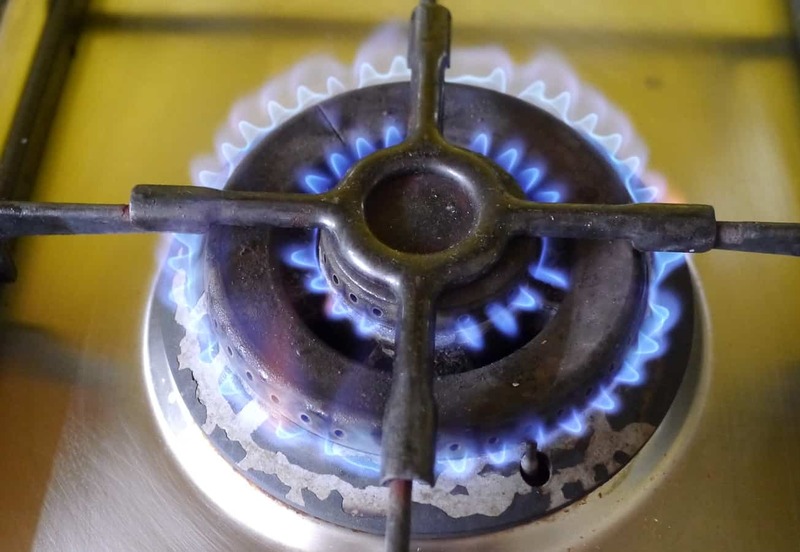 You may not be able to change your gas boiler, if you’re unfortunate enough to be stuck with an inefficient one (but if you are, here’s one idea for reducing how much energy it costs you). There are, however, plenty of other appliances that use energy that you do have control over. Think about all the other energy drains in the home: the heating, lighting, washing machine, dryer, the vacuum cleaner, small kitchen appliances, fridge and freezer, and other electrical equipment. Next time you need to change something, don’t just consider the initial cost, because in the long term it may end up costing more than you think. Are you a homeowner who has installed energy efficient appliances, or are you a renter who is stuck with rubbishy inefficient junk that your landlord installed to save himself a buck or two? Are there any other appliances you’ve switched to energy saving and know have saved you money and cut your bills? Do you have any tips or experiences to share? I always love to hear from you so don’t forget to leave a comment! I didn’t realise a pilot light could cost so much to run! 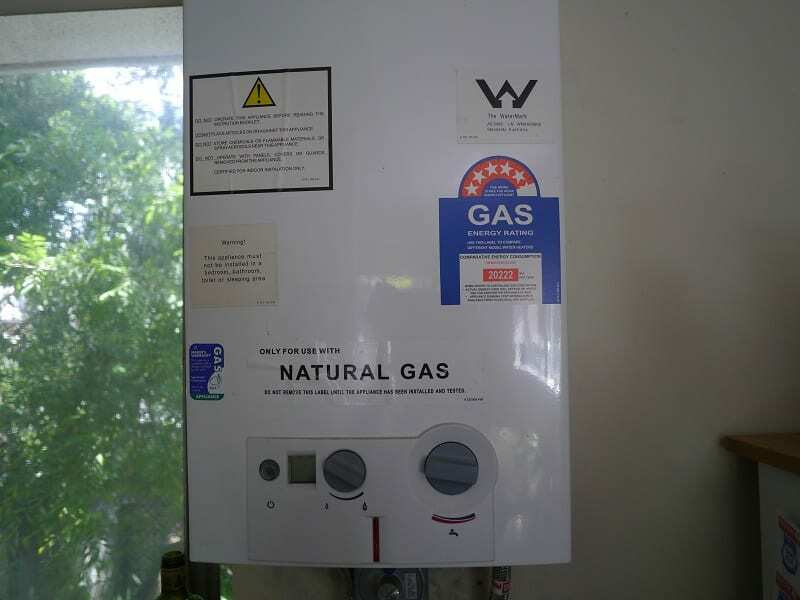 When I bought my unit and moved in, the electricity bills were huge due to an old inefficient electric hot water system. I replaced it with a solar evacuated tube system with electric boost and it has cut bills to nearly a third of what it was with the electric. 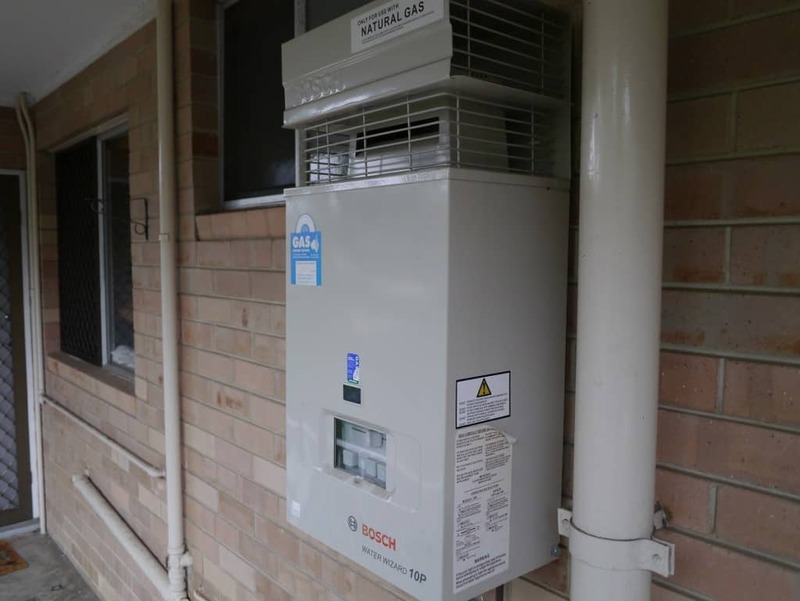 I went for electric boost over gas as there is the potential for hooking it up to solar panels in the future but I only have to boost it two or three times a year so the cost environmentally and to my pocket is minimal :-) it really is silly how few houses have solar in Perth. Water bills are pretty useful for finding things like toilets that have old seals that cause slow leaks inside the tank, or, if you have a house with outdoor faucets, a slow drip on a faucet that’s not used often enough to be noticed. (been there) But the pilot light is amazing! I didn’t realize it would make such a difference. I’m really lucky in the place where I live that we don’t pay water bills. There’s a water meter for the whole building and the strata company (management) split it amongst the home owners. So I don’t have to pay! Quite a few of the old flats around here are like that. It’s probably a good thing – I try not to waste any water, but if I had a bill to measure my use I’d probably get a little obsessive about it! Yes, it is quite amazing! Me neither! As a backup heat source. I googled “pyrolysis boiler” and it looked very complicated! Can you explain this to me please? Wow! This is an awesome blog worth reading for. It was helpful and informative too. Thanks for sharing these ideas on the internet! Lots of people will find this helpful too.